SINGAPORE - When she started out as a maid for the Wee family, Filipina Faustina Mey-ang Basali was trained to do household chores and to cook. But, 28 years later, the 65-year-old has become a vital part of her employer's family, even playing the role of a trainer for the family's second maid. On Sunday, she topped nearly 1,000 other foreign maids to clinch the Foreign Domestic Worker (FDW) of the Year Award at an award ceremony held at Singapore Polytechnic Convention Centre. The ceremony, attended by about 1,600 people, was part of an event to mark FDWs Day. Dance and musical performances were held throughout the ceremony. The FDWs Day event was organised by non-governmental organisation Foreign Domestic Worker Association for Skills Training, along with supporting partners. The Association of Employment Agencies (Singapore) organised the award ceremony to recognise winners of the FDW of the Year Awards, FDW Employer of the Year Awards, as well as other merit awards. The award Ms Basali won is given to foreign maids who have been nominated by their employers for their service and contribution. 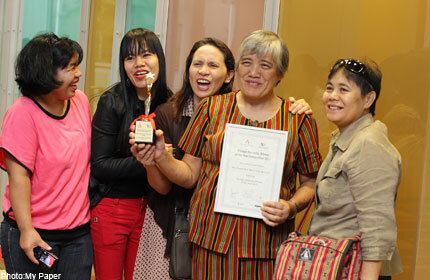 Madam Sheila Johns, who is in her 50s, won the Employer of the Year award, receiving a plaque and certificate. Ms Basali's employer - Mr Wee Cheng Hoon, 67, who works in the electronics-marketing industry - told My Paper: "Faustina is a loyal and trustworthy individual who has far exceeded my expectations of her when it comes to her work." Ms Basali said the most important part of her job over the years has been to look after her employer's three children. "Winning the award will motivate me to do my job better," she said. She walked away with $2,000 in prize money. Her employer's second daughter - Ms Valerie Wee, 39, who is a deputy director at the Nanyang Technological University - said: "Faustina is like an aunt I never had." She added: "She is regarded as a member of my family and if the day comes that she has to return home, we may even follow her back to the Philippines and buy an apartment there."